[S823] Jim Gilmer, electronic mail to e-mail address, 14 Mar 2003, (stating that she was born circa 1891). [S934] Billie Jones, electronic mail to scedgefi-l, 8 Feb 2004, (citing death certificate no. 10790, Greenwood Co., S.C., for Fannie Gilmer, dated 1945). [S933] Billie Jones, electronic mail to scsaluda-l, 6 Feb 2004, (citing death certificate no. 10790, Greenwood Co., S.C., for Fannie Gilmer, dated 1945). [S603] James Lang, computer file sent to Roger Bartlett, 25 Feb 2001 (naming George Franklin as her father). [S603] James Lang, computer file sent to Roger Bartlett, 25 Feb 2001 (naming Eveline _____ as her mother). [S603] James Lang, computer file sent to Roger Bartlett, 25 Feb 2001 (naming Mary Savannah Franklin as her mother). [S603] James Lang, computer file sent to Roger Bartlett, 25 Feb 2001 (naming Mary Savannah Franklin as his mother). Marriage*: He married Eveline _____. Marriage*: She married George Franklin. [S603] James Lang, computer file sent to Roger Bartlett, 25 Feb 2001 (naming Stephen Lawrence Gardner as her father). [S603] James Lang, computer file sent to Roger Bartlett, 25 Feb 2001 (naming Stephen Lawrence Gardner as his father). [S1104] Rankin County, Mississippi Cemetery Records 1824-1980 (Brandon, Miss. : Rankin Co. Hist. Soc'y, Inc., 1981), p. 198. [S603] James Lang, computer file sent to Roger Bartlett, 25 Feb 2001 (naming the place but not giving the date). [S1104] Rankin County, Mississippi Cemetery Records 1824-1980, above, p. 198 (giving the date but not the place). [S1108] Social Security Death Index, online at http://tinyurl.com/RootswebSSDI, viewed on 3 Feb 2007 (stating that he died in Sep 1973; not naming the place of death but stating that he lived in Puckett, Miss. when he died). [S1104] Rankin County, Mississippi Cemetery Records 1824-1980, above, p. 198 (stating that the cemetery is also known as Mayton Cemetery). John Hilton Gardner's tombstone, Terry Cemetery, Terry, Miss., courtesy of "Betty" on Find A Grave. 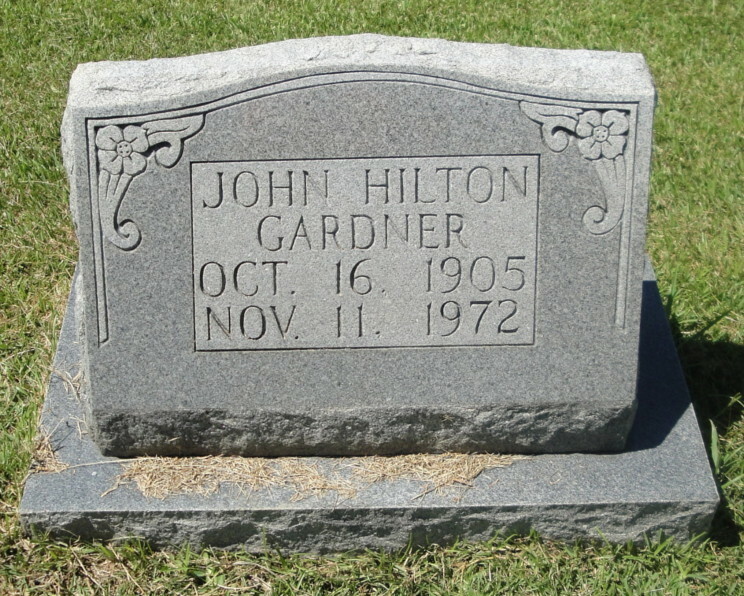 [S961] Find A Grave, online at http://www.findagrave.com, memorial for John Hilton Gardner, memorial no. 96791898, viewed on 7 Apr 2017. [S961] Find A Grave, online, above, memorial for Ruby Virginia Lack Gardner, memorial no. 96791792, viewed on 7 Apr 2017. [S312] Social Security Death Index, online at http://tinyurl.com/AncestrySSDI, viewed on 26 Dec 2003 (stating that he died in Sep 1966; not naming the place of death but stating that he lived in Jackson, Miss. when he died). [S603] James Lang, computer file sent to Roger Bartlett, 25 Feb 2001 (naming James Lang as his father). [S603] James Lang, computer file sent to Roger Bartlett, 25 Feb 2001 (naming Retta Gause as his mother). [S312] Social Security Death Index, online at http://tinyurl.com/AncestrySSDI, viewed on 26 Dec 2003 (not naming the place of death but stating that he lived in Tarpon Springs, Fla. when he died). [S824] San Angelo [Tex.] Standard-Times, 11 Mar 1955 (obituary of Elmo Maxwell David). Marriage*: He married Mary Ann Dickerson. [S825] Jim Gilmer, electronic mail to e-mail address, 31 Mar 2003, (naming William W. Tyner as his father). Marriage*: She married William W. Tyner. [S825] Jim Gilmer, electronic mail to e-mail address, 31 Mar 2003, (naming Mary Ann Dickerson as his mother). [S827] Sandie Jaggars, electronic mail to Roger Bartlett, 12 Apr 2003. [S827] Sandie Jaggars, electronic mail to Roger Bartlett, 12 Apr 2003, (stating that she was born in March 1849 or 1851). [S828] Patrick E. Roper, electronic mail to Roger Bartlett, 26 Mar 2003, (naming J. A. Covington as her father). [S828] Patrick E. Roper, electronic mail to Roger Bartlett, 26 Mar 2003, (naming Lenora Williams as her mother). [S828] Patrick E. Roper, electronic mail to Roger Bartlett, 26 Mar 2003, (naming J. A. Covington as his father). [S828] Patrick E. Roper, electronic mail to Roger Bartlett, 26 Mar 2003, (naming Lenora Williams as his mother). [S829] Old Hazlehurst (Miss.) Cemetery, online http://www.rootsweb.com/~mscopiah/, (naming George William Covington as her father). [S829] Old Hazlehurst (Miss.) Cemetery, online http://www.rootsweb.com/~mscopiah/, (naming Kate Ellis Covington as her mother). [S27] John Wright Boyd, A Family History: Lt. Thomas Fortson (1742-1824) and Some of His Descendants—Early Settler of Elbert County, Georgia (Danielsville, Ga.: Heritage Papers, 1973), p. 278. [S27] John Wright Boyd, A Family History: Lt. Thomas Fortson, etc., above, p. 279 (naming John Wesley Almond as his father). [S27] John Wright Boyd, A Family History: Lt. Thomas Fortson (1742-1824) and Some of His Descendants—Early Settler of Elbert County, Georgia (Danielsville, Ga.: Heritage Papers, 1973), p. 279 (naming John Wesley Almond as his father). [S27] John Wright Boyd, A Family History: Lt. Thomas Fortson, etc., above, p. 279 (naming Mildred ['Milly'] Gibbs as his mother). [S27] John Wright Boyd, A Family History: Lt. Thomas Fortson, etc., above, p. 279. [S27] John Wright Boyd, A Family History: Lt. Thomas Fortson (1742-1824) and Some of His Descendants—Early Settler of Elbert County, Georgia (Danielsville, Ga.: Heritage Papers, 1973), p. 279. [S27] John Wright Boyd, A Family History: Lt. Thomas Fortson (1742-1824) and Some of His Descendants—Early Settler of Elbert County, Georgia (Danielsville, Ga.: Heritage Papers, 1973), p. 281 (attributing information to "Notes on William Gibbs and Family," dated 31 Jan 1970 and provided by Pat Smith to John Boyd) (stating that she was born "1815-16"). [S27] John Wright Boyd, A Family History: Lt. Thomas Fortson, etc., above, pp. 281 (attributing information to "Notes on William Gibbs and Family," dated 31 Jan 1970 and provided by Pat Smith to John Boyd) (naming Sarah Ann _____ as her mother), 291 (naming Sarah Ann _____ as her mother). [S27] John Wright Boyd, A Family History: Lt. Thomas Fortson, etc., above, pp. 281 (attributing information to "Notes on William Gibbs and Family," dated 31 Jan 1970 and provided by Pat Smith to John Boyd) (naming Sarah Ann _____ as his mother), 286 (naming Sarah Ann _____ as his mother). [S27] John Wright Boyd, A Family History: Lt. Thomas Fortson, etc., above, pp. 281 (attributing information to "Notes on William Gibbs and Family," dated 31 Jan 1970 and provided by Pat Smith to John Boyd) (naming Sarah Ann _____ as his mother), 288 (naming Sarah Ann _____ as his mother). [S27] John Wright Boyd, A Family History: Lt. Thomas Fortson, etc., above, pp. 281 (attributing information to "Notes on William Gibbs and Family," dated 31 Jan 1970 and provided by Pat Smith to John Boyd) (naming Sarah Ann _____ as her mother), 288 (naming Sarah Ann _____ as her mother). [S27] John Wright Boyd, A Family History: Lt. Thomas Fortson, etc., above, p. 281 (giving the date but not naming the place, attributing information to "Notes on William Gibbs and Family," dated 31 Jan 1970 and provided by Pat Smith to John Boyd) (separately giving the date and place without attribution). [S27] John Wright Boyd, A Family History: Lt. Thomas Fortson, etc., above, pp. 281-82. [S27] John Wright Boyd, A Family History: Lt. Thomas Fortson (1742-1824) and Some of His Descendants—Early Settler of Elbert County, Georgia (Danielsville, Ga.: Heritage Papers, 1973), pp. 281 (attributing information to "Notes on William Gibbs and Family," dated 31 Jan 1970 and provided by Pat Smith to John Boyd) (naming Francis Gibbs as his father), 286 (naming Francis Gibbs as his father). [S27] John Wright Boyd, A Family History: Lt. Thomas Fortson, etc., above, pp. 281 (attributing information to "Notes on William Gibbs and Family," dated 31 Jan 1970 and provided by Pat Smith to John Boyd), 286. [S27] John Wright Boyd, A Family History: Lt. Thomas Fortson, etc., above, p. 286. [S27] John Wright Boyd, A Family History: Lt. Thomas Fortson (1742-1824) and Some of His Descendants—Early Settler of Elbert County, Georgia (Danielsville, Ga.: Heritage Papers, 1973), pp. 281 (attributing information to "Notes on William Gibbs and Family," dated 31 Jan 1970 and provided by Pat Smith to John Boyd) (naming Francis Gibbs as his father), 288 (naming Francis Gibbs as his father). [S27] John Wright Boyd, A Family History: Lt. Thomas Fortson, etc., above, pp. 281 (attributing information to "Notes on William Gibbs and Family," dated 31 Jan 1970 and provided by Pat Smith to John Boyd) (stating that he was born circa 1852 without naming the place and speculating that he and Emily were twins), 288 (stating that he was born "about 1852-3 in Georgia"). [S27] John Wright Boyd, A Family History: Lt. Thomas Fortson, etc., above, p. 288 (naming Joseph Gibbs as his father). [S27] John Wright Boyd, A Family History: Lt. Thomas Fortson (1742-1824) and Some of His Descendants—Early Settler of Elbert County, Georgia (Danielsville, Ga.: Heritage Papers, 1973), pp. 281 (attributing information to "Notes on William Gibbs and Family," dated 31 Jan 1970 and provided by Pat Smith to John Boyd) (naming Francis Gibbs as her father), 288 (naming Francis Gibbs as her father). [S27] John Wright Boyd, A Family History: Lt. Thomas Fortson, etc., above, pp. 281 (attributing information to "Notes on William Gibbs and Family," dated 31 Jan 1970 and provided by Pat Smith to John Boyd) (speculating that she and Joseph were twins), 288 (speculating that she and Joseph were twins). [S27] John Wright Boyd, A Family History: Lt. Thomas Fortson, etc., above, pp. 281 (attributing information to "Notes on William Gibbs and Family," dated 31 Jan 1970 and provided by Pat Smith to John Boyd) (giving the date without naming the place), 288. [S27] John Wright Boyd, A Family History: Lt. Thomas Fortson (1742-1824) and Some of His Descendants—Early Settler of Elbert County, Georgia (Danielsville, Ga.: Heritage Papers, 1973), pp. 281 (attributing information to "Notes on William Gibbs and Family," dated 31 Jan 1970 and provided by Pat Smith to John Boyd) (naming Francis Gibbs as her father), 291 (naming Francis Gibbs as her father). [S27] John Wright Boyd, A Family History: Lt. Thomas Fortson, etc., above, p. 291. [S27] John Wright Boyd, A Family History: Lt. Thomas Fortson, etc., above, pp. 281 (attributing information to "Notes on William Gibbs and Family," dated 31 Jan 1970 and provided by Pat Smith to John Boyd), 291. [S27] John Wright Boyd, A Family History: Lt. Thomas Fortson (1742-1824) and Some of His Descendants—Early Settler of Elbert County, Georgia (Danielsville, Ga.: Heritage Papers, 1973), pp. 281 (attributing information to "Notes on William Gibbs and Family," dated 31 Jan 1970 and provided by Pat Smith to John Boyd), 291. [S27] John Wright Boyd, A Family History: Lt. Thomas Fortson, etc., above, p. 291 (citing 1880 U.S. Census, Twiggs Co., Ga.).